When the Supreme Court declined to hear our case, we had no recourse but to settle our Federal lawsuit. We continue to stand up for family farms, for sustainable food, and for scientific integrity in government. Thank you for your support over the years. We could never have gotten through this without our loyal fans, customers, and supporters. It is our hope that justice eventually prevail, and we continue to be encouraged by the truth finally getting out in articles like the Michael Ames' Newsweek article (January 15, 2015), see Newsweek article here. 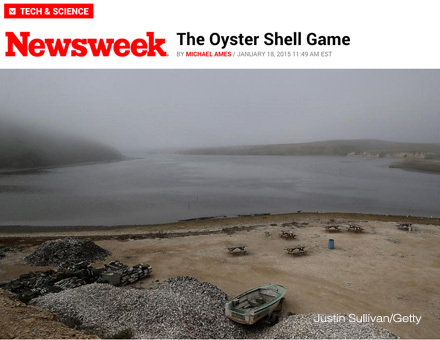 The National Park Service has removed the oyster shack and all other historic buildings at the site, and is in the process of dismantling and removing the oyster racks and related materials, as is its responsibility under the settlement agreement. We are still formulating our future plans and will keep people posted at this website. For background on the unjust removal of the farm, please see savedrakesbay.com. Senator Feinstein writes in to the Marin Independent Journal: "Accurate, objective science should guide environmental policy, and when science has acknowledged problems, it should never be used to make decisions. There is no guarantee that any given study is perfect, but we should all agree that decisions based on science we know to be flawed is a stark violation of the public trust." Click here to read the entire op-ed piece. We believe that sustainable farming methods are essential to conserving and restoring our natural surroundings. With this in mind, we are urging everyone to support local farmers. 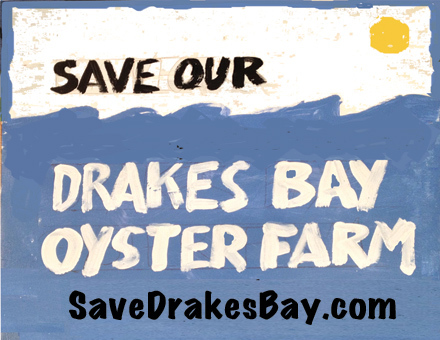 Print and post your own Save Our Drakes Bay Oyster sign! Especially for large orders, reserving oysters is a good idea. By calling us one or two days ahead of time you'll help ensure that your oysters will be ready when you visit.